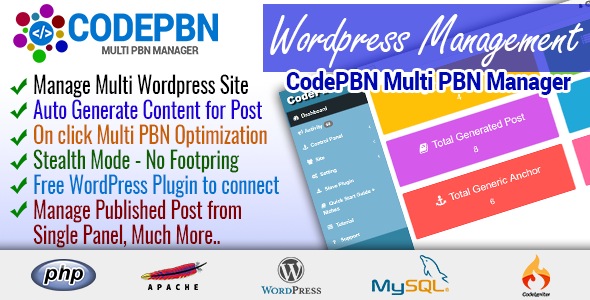 â€œCodePBN Multi PBN Managerâ€ is a PHP script & included a WP Plugin for WordPress PBN (Private Blog Network) or Manage your WP personal BLOG! Optimization is good for new WordPress Blog/Site, As soon as you install a fresh copy of WordPress on your server you have to optimize for better SEO. This script does all its own, it will install a random theme, a plugin for link juice kipper, also you can give plugin zip URL to install automatically and activate!